There are also some technology specific issues, for example, if you want solar panels installed you need your property to have an energy performance certificate of D or above if you want the higher tariff. The feed-in tariff changes from time to time (normally every three months) depending on the number of installations that have taken place recently – however the thing to remember is that you are always tied in to the tariff you start at. Any changes to the feed-in tariff effect new systems not existing one. Once you have a renewable energy system installed it will be generating electricity, some of which you will be using on site and some of which you will be exporting to the grid (your neighbours will be using it more than likely!). The Feed in Tariff pays you for all of the electricity you generate whether you use it on site or export it to the grid! You get an additional, smaller payment for the electricity you export to the grid called the export tariff. These three figures are often lumped together into one ‘Annual financial benefit’ and used to calculate your return on investment and payback period. This is a fixed price per kilowatt-hour (kWh), set at different levels for different technologies and installation sizes. The tariff levels lower for new projects over the years, but any individual installation will continue to receive the same generation tariff level throughout its entire support period under the FIT scheme. This is paid for every kWh of electricity generated. The tariff will increase annually with inflation. This is measured accurately by an Ofgem approved generation meter. Payments are made by the supplier based on the readings from the generation meter. Generators are guaranteed an extra payment for any electricity generated that is not used on-site. It is worth noting here that the export tariff is not actually measured but is for most small-to-medium domestic scale installations assumed to be 50% of the total generated. In our experience this is a pretty accurate estimation. Generators also benefit because they can use the electricity they generate on-site to offset some or all of the electricity they would otherwise have had to buy. Tariffs are set through consideration of technology costs and electricity generation expectations at different scales, and are set to deliver an approximate rate of return of 5-8% for well sited installations although it is common for rates of return to be 10% or higher. Accordingly, the tariffs that are available for new installations “degress” each year. FITs income for domestic properties generating electricity mainly for their own use will not be taxable income for the purposes of income tax. The following table is not exhaustive and is correct of the 9/2/2013. The table demonstrates the tariffs in pence per kWh. Note: The feed-in tariffs are linked to the Retail Price Index. If you have any questions about the tariffs please feel free to call Cambridge Solar on 01223 863 885. 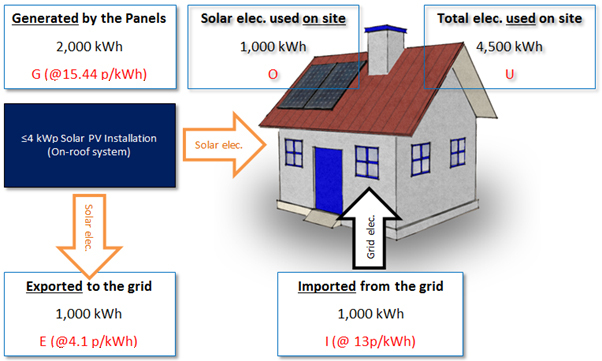 In this illustrative example, the site generates (G) 2,000 kilowatt-hours (kWh) per annum (here with a retrofitted <4 kWp solar PV system) which is metered using the site’s generation meter. They are then assumed to have exported (E) 50% of their generation onto the local electricity network (either as metered exports or deemed exports). The other 50% of generation is used on-site (O). The household uses (U) a total of 4,500 kWh per annum, therefore, they need to import (I) 3,500 kWh from their electricity supplier. Using this illustrative example, the generator will receive a FITs payment of £308 per annum (made up of a generation tariff payment of 2,000 kWh x 15.4 p/kWh = £308 plus an export tariff payment of 1,000 kWh x 3 p/kWh = £41). They also derive a benefit from the 1,000 kWh they generate and use on-site as that will offset 1,000 kWh they would otherwise have had to buy from their electricity supplier. Assuming an import price of 13 p/kWh this would be a saving of £130 (1,000 kWh x 13 p/kWh). With your solar pv system you will have an ofgem approved ‘Generation Meter’ installed. This will measure the amount of kWh your solar panel or wind turbine system has generated. The number on the screen the cumulative total you have generated. You may find this is a slightly different figure to the number on your inverter but they will be very close. The generation meter is the correct or ‘official’ reading. Every now and then (probably every quarter) your electricity supplier will ask for a reading. It is sometimes possible to submit readings online. Based on this reading you will get a payment giving you the generation tariff for 100% of the reading and the export tariff for 50% of the reading. That’s it…you can then sit back and enjoy they free electricity and the regular payments! Information obtained from ofgem website 9/2/2013. Encompassing the Lumen Energy Supply Limited, Candela Energy Supply Limited, Magnetic Energy Supply Limited, Coulomb Energy Supply Limited & Circuit Energy Supply Limited Licenses. For solar PV systems, firstly you will need to ensure you house has an energy performance certificate of a D or above or you will only be eligible for the lower tariff rate. This involves getting an EPC surveyor to assess your property. Cambridge Solar includes this in the price of their systems. After your solar panel or renewable energy system has been installed you will need to register it with your electricity supplier. Return your completed form back to your electricity supplier within 5 working days of your solar PV installation being completed – any later than this and your electricity supplier will not accept you initial generation meter reading. They don’t like to make things easy! Get in touch with us if you have any questions or queries regarding the application process.